Yesterday, Sartell, Minnesota Planning Director Anita Rasmussen spoke about the importance of the local paper mill, which provided employment to generations of residents. 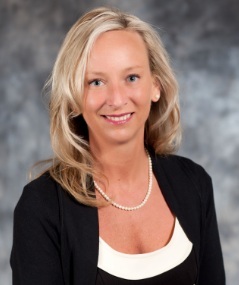 Today she continues by telling about the tragic Memorial Day explosion -- and how the planning department and commission responded. Like most infamous occasions, nearly every Sartell resident can remember what they were doing and where they were when they started to see the dark billowing clouds of smoke emerge into the sky over the tree line. all photos in this post courtesy City of Sartell. For some of us who happened to be outside on such a beautiful sunny Memorial Day, we can recall the lump in our throats when we heard the explosion. Ironically, though a city employee, the first I heard of the source of the explosion was from my 14-year-old daughter. She was on Facebook, and the timeline was erupting with images and accounts of an explosion at the Verso Paper Mill -- one of Sartell’s main industry for over one hundred years. 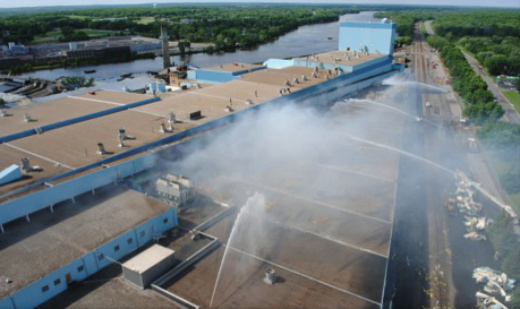 The explosion and fire at the Verso Paper Mill on Memorial Day 2012 triggered a massive 10-day fire response event supported by 92 fire departments from across Minnesota. The location of the explosion was within the paper warehouse section of the 780,000 square foot building. Hundreds of 8-foot diameter rolls were kindling for the fire and made for a complex emergency operation. 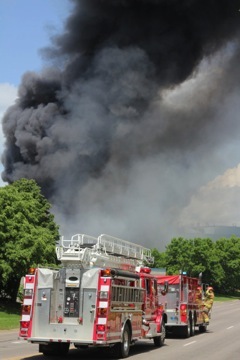 An overheated air compressor was the cause of the explosion. The explosion also contributed to the destruction of the power transformer, which was the primary energy source for the mill. 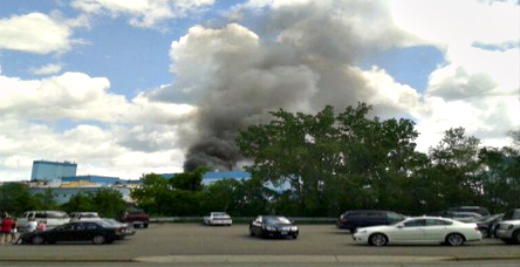 One employee perished in the explosion and four others were injured. A tragedy for the community in so many ways. Sartell’s Fire Chief, Police Chief, and City Administrator spent countless hours addressing the media as this explosion had become a huge media event. Visits from the Governor and several Congressional and State leaders were testament to the severity of the explosion and the ensuing uncertainty of whether or not the Verso Mill would be able to reopen. The paper mill was situated on 66 acres along the Mississippi River, and contained 780,000 square feet of industrial pulp and paper production. It also included a dam and hydroelectric facility. Without power to the mill, and a gapping hole in the middle of the large warehouse, layoff notices to 260 people were imminent. On day four of the fire response event, our Planning and Community Development Department initiated what we dubbed the “Verso Production Initiative,” with the goal of getting the Verso Paper Mill back into production by assembling a “tool box” of resources needed to enable an option to rebuild and open. There was just a strong urge by various community members to do something instead of just sitting around, waiting for an announcement. The community wanted to demonstrate to Verso its interest and dedication in having the mill reopen. Job Impact: 260 employees at time of explosion, and 175 jobs permanently laid off six months earlier; plus an estimated 700 jobs affected in the timbering industry in northern Minnesota. Utility Impact: $150,000+ in annual water & sewer utility revenues, Sartell’s largest utility customer. 1. Rebuild & Production -- Assess the fiscal impact and align resource options to achieve rebuild and re-establish operations of the mill. 2. Workforce -- Assemble a toolbox of programs and other forms of assistance available to address production and workforce issues. The work attempted by the Verso Production Initiative ended when the closure announcement became a reality on August 2, 2013. Damages to the building and its energy source were estimated to be tens of millions of dollars. Verso CEO Dave Paterson and his top managers met with Governor Mark Dayton, legislative representatives, and Sartell Mayor Joe Perske to convey the corporation's decision to forgo rebuild efforts and permanently cease operation of the mill. For Verso, it appeared the costs of rebuilding were simply too high and would take too long, especially given the generally poor economic prognosis for the paper mill industry. Paterson further indicated that efforts to expedite the sale of all assets of the mill in Sartell would commence immediately. The hope of another paper company buying the site were widely believed to be nothing more than a pipe dream due to the decline of the paper mill industry in general. Who else could use such a huge building? What type of industry could make use of a facility with the responsibility of also handling a dam across the Mississippi River? -- Did we have the appropriate uses, conditional uses, and interim uses in the district? -- Were the setbacks reflective of the needs and desires of the community? -- What if a buyer wanted to demolish the large mill building? How could we guarantee that “quality of life” issues beyond those provided within the building code were addressed in a prospective demolition? Our current industrial district regulations were not adequate in addressing my concerns. As a result, planning staff -- working with the planning commission -- immediately set out to create an interim use permit process for demolition, providing broader control over issues such as environmental reviews, transportation planning for heavy loads, as well as noise, dust and hours of operation. All that work in creating a system for demolition proved useful when a buyer for the mill site was announced at the end of January 2013. Coming tomorrow -- Preparing for a New Owner: Who Would Buy & Rebuild a 107-year-Old Paper Mill?